Фирма "Bristol" желала создать дешевый самолет для демонстрации потенциальным покупателям своего двигателя Jupiter. Было предложено использовать модифицированный планер истребителя F.2B, и в январе 1923 года Уилфред Рейд, ставший главным конструктором после ДальшеMore>>> ухода Фрэнка Барнуэлла, одобрил это решение. Выгоды, которые сулила такая дешевая конверсия, были очевидны, и фирма решила построить один экземпляр такого самолета, получившего обозначение Type 76 Jupiter-Fighter, для участия в авиационной выставке в Швеции, которая должна была открыться в июле 1923 года. ONE of the machines which achieved considerable merit during the Great War in the service of the British Air Force, and which even today is to be found in large numbers on the active list, both in the British Air Force and in various foreign services, is the Bristol Fighter, type F.2B. This machine undoubtedly fulfilled the exact requirements for which it was designed - general fighting, bombing, and reconnaissance duties - and its quality of performance was only limited by the performance of the engines available at the time of its use. The engine with which it was then fitted was the 260 h.p. Rolls-Royce "Falcon," and it must be admitted that this combination left little to be desired. Since that time, however, considerable development has taken place in aero-engines, and higher powers and better performance with aero-engines is now available. In this connection the success attained by the 400 h.p. Bristol "Jupiter" engine is well known; it is not surprising, therefore, that the Bristol Company have considered the question of adapting the already famous "Fighter" aeroplane for a renewed period of successful activity. The result of this "monkey gland grafting" experiment has, we understand, given very satisfacory results, and the "F.2B" has not only been entirely rejuvenated, but it is now livelier than ever! One of these machines is being shown at the Gothenburg Exhibition, in addition to the "Jupiter" engine itself, the "Lucifer" engine and the Bristol gas starter. From the accompanying illustration of the new "F.2B" it will be seen that the Bristol Company have succeeded in making an extremely fine job of this new installation, and the "Fighter" - always, to our way of thinking, a very pretty and business-like looking machine - has, if anything, improved in appearance, as well as in performance. As regards the general design and construction of the Bristol "Jupiter-Fighter," inasmuch as the original "F.2B" is so well known - to most of our readers, at any rate - and as we are somewhat restricted as to space in this review of the Exhibition, it should suffice if we briefly set forth its principal features. The outstanding features, perhaps, are to be found in the design of the fuselage and the arrangement of the wings. The fuselage is of rectangular section tapering at the rear to a horizontal knife-edge, thereby enabling the various tail members to be brought down low, out of the way of the gun. The top of the fuselage is kept flat for this purpose, also. In order to bring the position of the pilot and the gunner as high as possible in relation to the top plane without increasing the depth of the fuselage, the lower plane is not, as is usually the case, attached direct to the bottom of the fuselage, but runs right underneath some distance below. The wings, in this case, are attached to a small lower centre section, secured to the fuselage by short struts, or brackets. This arrangement, of course, necessitates a slight modification in the orthodox type of undercarriage, but the difficulty, as may be seen from the illustration, has been very neatly overcome. Thus the pilot and gunner both have an excellent range of vision according to their respective requirements. The pilot is situated forward, immediately aft of the top plane rear spar, while the gunner, with his gun mounting, sits just behind. The performance, dimensions, etc., of the "Jupiter-Fighter" are :- Speed at ground level, 133 m.p.h. ; at 10,000 ft., 129 m.p.h. ; at 15,000 ft., 120 m.p.h., and at 20,000 ft., 105 m.p.h. Rate of climb to 6,500 ft., 10,000 ft., 15,000 ft. and 20,000 ft., come out at 5, 8 1/4, 14 1/2, and 27 1/2 mins. respectively. The service ceiling is 22,500 ft.
Span, 39 ft. 3 ins. ; chord, 5 ft. 6 ins. ; overall length, 25 ft.; weight empty, 1,860 lbs. ; weight fully laden, 3,350 lbs. ; weight per sq. ft., 8-27 lbs. ; weight per h.p., 8-4 lbs. ADVANCED TRAINING MACHINE: This Bristol biplane with Bristol Jupiter engine is used at the Bristol Flying School for the advanced training of pupils, and as such is, perhaps, the highest-powered training machine in regular use. For school purposes, however, the speed of the Jupiter is cut down to a certain figure, so that the actual power normally developed when used in a school machine is not the full power of the engine. The Bristol "Jupiter-Fighter," the latest version of the famous F.2B "Fighter," fitted with a 400 h.p. "Jupiter" engine. 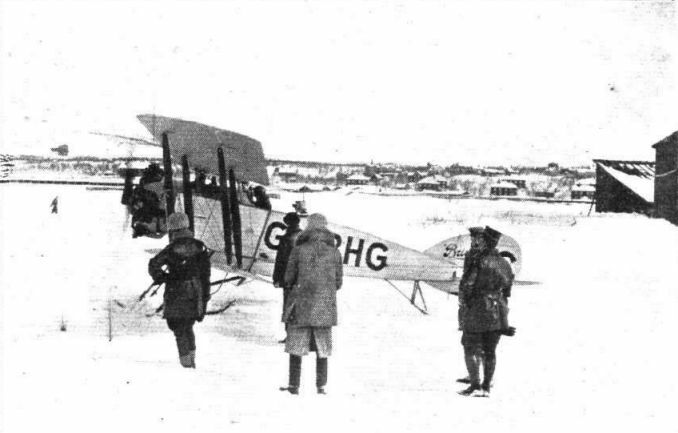 A "Bristol" within the Arctic Circle: The Bristol Fighter, with Bristol "Jupiter" engine, starting for a flight at Kiruna aerodrome, Sweden. Note the ski undercarriage. 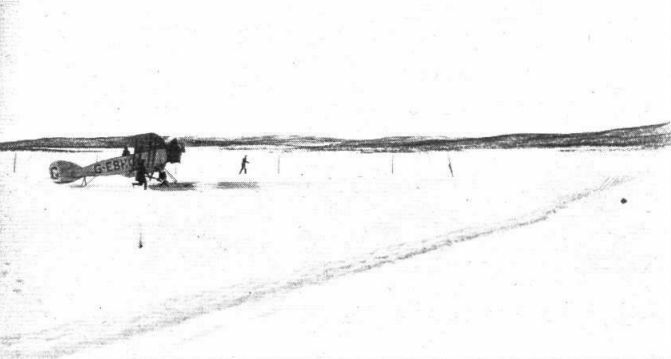 Landing on the Snow: The Bristol Fighter alighting at Kiruna after a trial flight. 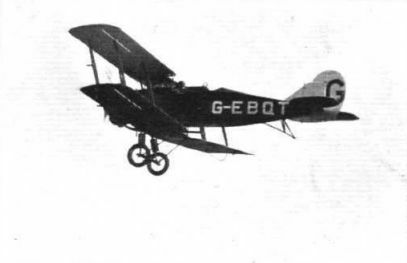 A BRISTOL EVENT: Mr. C. F. Unwins flying "QT" during the meeting. 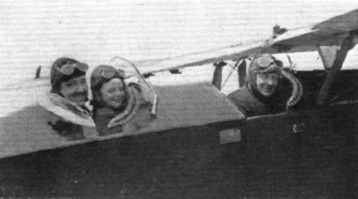 COMPETITORS AND JUDGES: The photograph shows Mr. H. Thomas, a director of the Bristol Aeroplane Company, and his son setting off from Filton for the Air Port at Whitchurch in a Bristol machine piloted by Mr. Campbell.